2.6.2004 Nicolai Ghiaurov is dead! I did not know that he died in the morning when I came to the opera house for Verdi's Vespri Siciliani with Ruggero Raimondi, another star basso, as Procida. 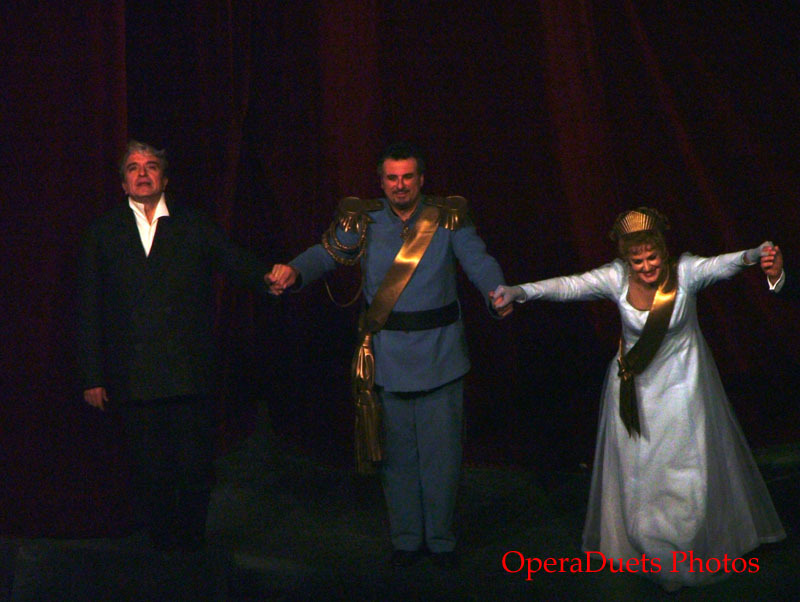 After the only intermission (before act 4), the indendant of Opernhaus Zurich Alexander Pereira came out, first he said nobody is sick, but the opera house has just received a call that the great basso Nicolai Ghiaurov is dead, he died this morning. The house sighed at this devastating news. Alexander Pereira then asked the audience to stand up for this great artist. And the house rouse up. And we all sat down as if we were only one body. The indentant told a bit of Ghiaurov's career in Zurich, and he said that the Opernhaus is dedicating this performance to Nicolai Ghiaurov. 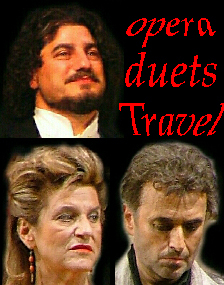 The artists was all grieved by the loss, but nevertheless this two last acts was really fantastic sung and acted. And now back to the beginning. The Overture of I Vespri Siciliani is a truly wonderful piece, and it brought back memories of the first 3 tenors concert, the original in Roma. I could see the images from the TV, and when the overture ended I almost waited that Carreras would come to sing Lamento di Federico. But instead there was another Lamento for Federico, Elena is mourning her brother. Paoletta Marrocu as Elena, maybe it was my ears that needed getting used to her voice or she sang better as the evening progressed, or both. Leo Nucci, Guido di Monforte, was really making a tremendously fine job in Vespri. It was a perfect role for him, his voice was really beautiful and his presence was tremendous. Marcello Giordani, Arrigo, was in the first 3 acts not in the best voice, but luckily in act 4+5 he was fantastic. Ruggero Raimondi, Giovanni da Procida, was wonderful but unfortunately in this opera all the characters is one-dimensional so it was only one side of RR, he was all revenge and patriotic. Before the intermission I thought that only the overture was highlight but luckily there were more "juicy" stuff in act 4+5. All day long the skies were threatening with rain but the rain held until after the opera. Then the rain poured down. No waiting at the stage door for me, no umbrella and after all tomorrow I will have to get up early in the morning for a early flight to VIENNA and my second Italiana.